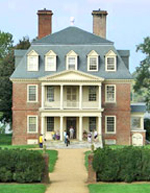 Shirley, a plantation established in 1613 on the James River, is Virginia’s first. It was also the birthplace of Confederate General Robert E. Lee’s mother and the site of her 1793 marriage to Henry “Light Horse Harry” Lee. After more than 150 years, Shirley needed a facelift, so her restored columns were pushed back into place this past Thursday and renovations were made to the house’s two-story porticoes. This restoration would not have been possible without Charles Carter III’s donation of 121 acres to the state under a historic-preservation easement. The easement is a voluntary legal agreement that provides for continued private ownership of the landmark, while granting the state authority to protect its historical, architectural and archaeological features. Carter, Shirley’s 11th-generation owner, said the easement would lift a burden from future generations of the family, ensuring that the land would be preserved and passed on. Read more at The Daily Press.